How do I use the IRM (Information Rights Management) email templates? An enterprise IT admin can apply IRM templates to any composed email. The IRM templates are synced from the account server on need basis. 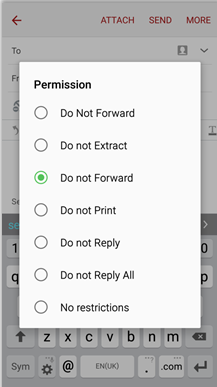 For example, the message sender can restrict the message forward, reply, print, etc. In received email, these options will be disabled. Example Use case: Restricting message forwarding. 1. Go to Message Composer screen > more > permission. 2. Select Do not forward. 3. Compose and send the email. 4. 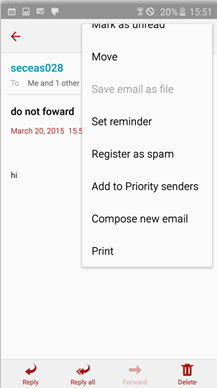 Recipient receives the email with the forward option disabled.